TransylvanianDutch: Wordless Wednesday: A Monument to Fascism? It's amazing the bits of history one can find online. The below article appeared in Life Magazine, March 8, 1948 - p. 113. How interesting!! I live in (near) StL and didn't know that - but then I didn't live here when it was being built. 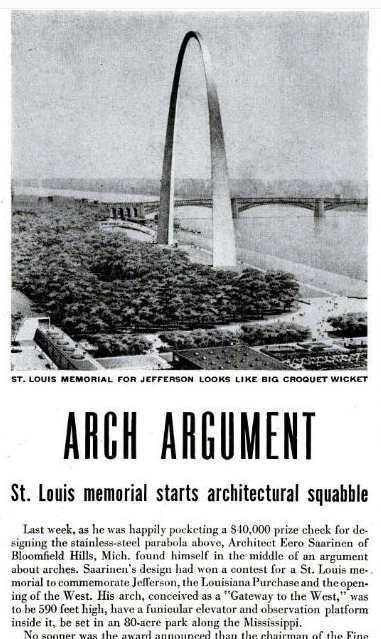 I love the movie about the building of the Arch - as corny as it is "And the thing was done" [spoken in deep, serious announcer voice] I think I like it because they tell about how it was predicted that 13 people would die during the building and no one did. Thanks for this history lesson. Terrific tidbit. Thanks. And I adore the wicket idea. It may replace the image of the giant magnet that the MLB ads for last year's All Star Game implanted in my mind. I'd heard the croquet wicket joke before, but I had no idea it went all the way back to 1948. That is absolutely fascinating! 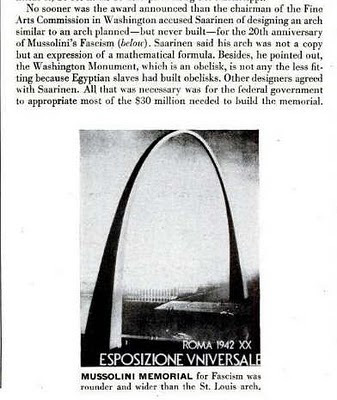 I'd never heard of the Fascist arch before.